The redesigned iOS 6 App Store is turning out to be an interesting leak-spot. 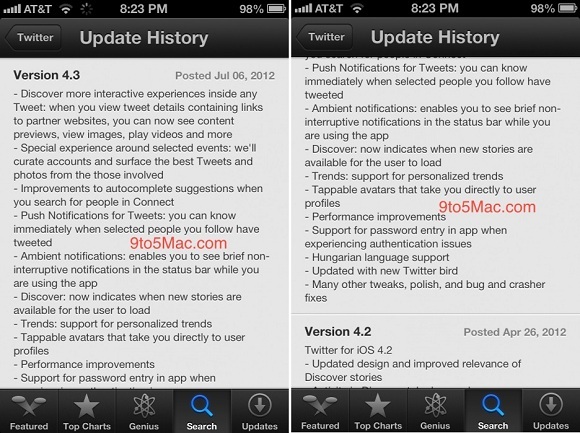 Thanks to it we now know that the Twitter for iPhone will soon be updated to the v4.3 and bring in many important changes to the client. The Twitter for iPhone has been lacking behind in providing features that are already up with other Twitter clients and making a note of this the next release of the app will includes loads of improvements and new features. Discover more interactive experiences inside any Tweet: when you view tweet details containing links to partner websites, you can now see content previews, view images, play videos and more. Special experience around selected events: we’ll curate accounts and surface the best Tweets and photos from those involved. So as we can see, the next update of the app would bring in better notifications, even push notifications is included, the auto complete is largely improved, content inside any tweet is more interactive, the new Twitter Bird is arriving in this version too apart from loads of other tweaks and improvements. We do not know as to when the update would be rolled out, but it should only be a matter of a few days when the update is out for all users.